The story of what happened to Gary Tyler nearly 37 years ago remains an ongoing American tragedy of epic proportions and a perversion of the American justice system. Who is Gary Tyler you ask? Tyler, an African-American from Louisiana, has been jailed since he was 16 years old for a 1974 murder that many believe he did not commit. An all-white jury convicted him based entirely on the statements of four witnesses who later recanted their testimony. In fact, Tyler's case has been taken up by Amnesty International as well as many others. Sadly, he remains imprisoned long after many other death row inmates have been exonerated for the crimes they were falsely convicted of by racist and corrupt prosecutors. Mr. Tyler, a sophomore at Destrehan High, was on a bus filled with black students that was attacked on Oct. 7, 1974, by a white mob enraged over school integration. A shot was fired and a 13-year-old white boy standing outside the bus collapsed, mortally wounded. Mr. Tyler was arrested on a charge of disturbing the peace after he talked back to a sheriff’s deputy. Although the bus and its passengers were searched and no weapon was found, Mr. Tyler was taken into custody, savagely beaten and accused of committing the murder. A gun was found during a subsequent search of the bus and witnesses were rounded up to testify against Mr. Tyler. It turned out that the gun (which has since disappeared) had been stolen from a firing range used by officers of the sheriff’s department. All of the witnesses who fingered Mr. Tyler would eventually recant, saying they had been terrorized into testifying falsely by the authorities. While the early and mid-70's reflect a time in American racial history that we would all like to forget, the truth is that the American justice system and State of Louisiana has continued to fail Tyler year after year. An article from 2006 in the International Socialist Review took up the case and the ongoing issues which have conspired to keep Tyler in prison and after a through review can only conclude that Tyler is a political prisoner in a nation that has long disavowed such practices and condemns other nations for employing similar practices. How is it possible that, given all the evidence of his innocence and the blatantly racist nature of his frame-up, Gary Tyler is still in prison? Gary's case takes us straight into the heart of darkness of the Louisiana criminal justice system. Powerful political forces have conspired to keep him behind bars. Both racism and political persecution have played their part. In 1990, the Louisiana attorney general argued against a pardon for Tyler, because he has “demanded that he be allowed to correspond with socialist and communist publications like the Socialist Worker. Democracy Now has posted a transcript of an unaired interview that Tyler conducted several years ago. Its definitely worth a read. If you are interested in Tyler's case please visit Free Gary Tyler or please send an e-mail to Louisiana Governor Bobby Jindal asking him to re-consider Tyler's case and exonerate him. Nice post, but it is a tragic story. It's such an important and I think overlooked aspect of reggae music- being able to make you dance while also shining light on injustices of the world. My band, Destroy Babylon, wrote a song called "Free the King" about Arnie King who has been in prison since 1972 for killing a man in Boston. This story differs from Gary Tyler's- Mr. King has admitted to being responsible and has rightfully served his time. 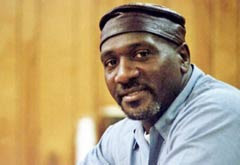 However, throughout his nearly 40 years behind bars, he has taken major strides in changing and educating himself and others, proving that he should be allowed back into society as a free man. If a model case for commutation can't succeed, why does the American justice system even bother to offer it? Please read about his story at www.arnoldking.org and see if you agree. The song "Free the King" off the album Long Live the Vortex can be heard at DestroyBabylon.com. Gran Blog, ¡Realmente enorme esta página!, creo que el mensaje social es muy importante para que la música tenga sentido de ser, claro, como otros géneros hablando de ese mensaje social, "la conciencia social" es primordial para encontrar la justicia y la canción de UB40 es un maravilloso ejemplo (y el primer corte del disco). En México tristemente lo digo: hay poca "Conciencia social" y los gobernantes abusan del pueblo, pero queda una luz de esperanza cuando aparecen personas que sin más ánimo de lucro económico que la verdad y justicia luchan. Gracias por permitirme escribir un par de ideas, la música de este blog: Simplemente "Grandiosa", me encanta.